Whenever I used to go to pot luck type parties and someone brought hummus, I turned my nose up at it. For some unknown reason, I thought that hummus appealed only to die hard vegans and vegetarians and didn’t make party food. But, recently I have had the opportunities to try a lot of varieties of this dish and have become a real hummus fiend! 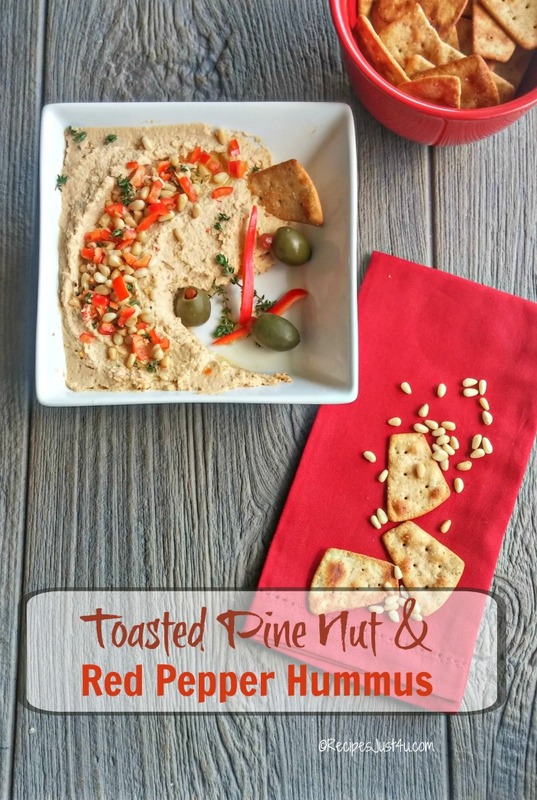 This recipe for red pepper and Toasted Pine Nut Hummus is super easy to make and is creamy and delicious. It is so much better for you that cream cheese dips and you will love the taste of it. It has become one of my favorite easy appetizers. 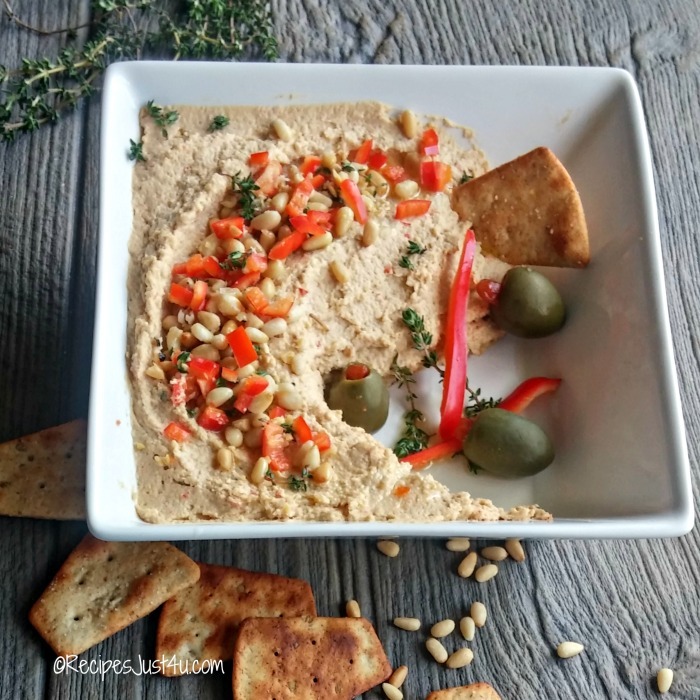 This Red Pepper and Toasted Pine Nut Hummus makes a great party appetizer that is very heart healthy. I love 30 minute meals and appetizers. There is nothing like getting something on your party table in a flash when unexpected guests arrive. 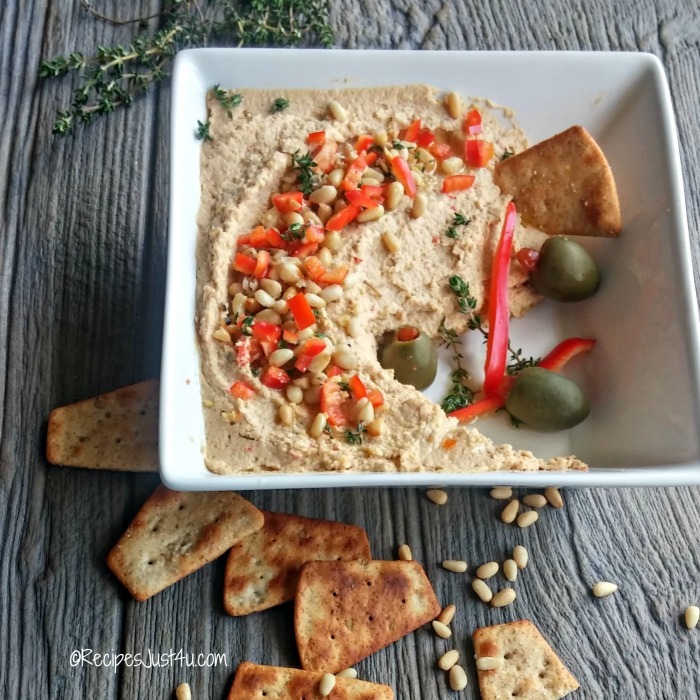 Hummus is one of those dished that is so versatile. (I can say that now that I have rediscovered the joy of it!) It makes a great dip. I love having it with whatever else goes on my luncheon plate with some slices of vegetables to dip into it, and making wraps with it is also a new found love of mine. What I love most about this recipe is how easy it is. 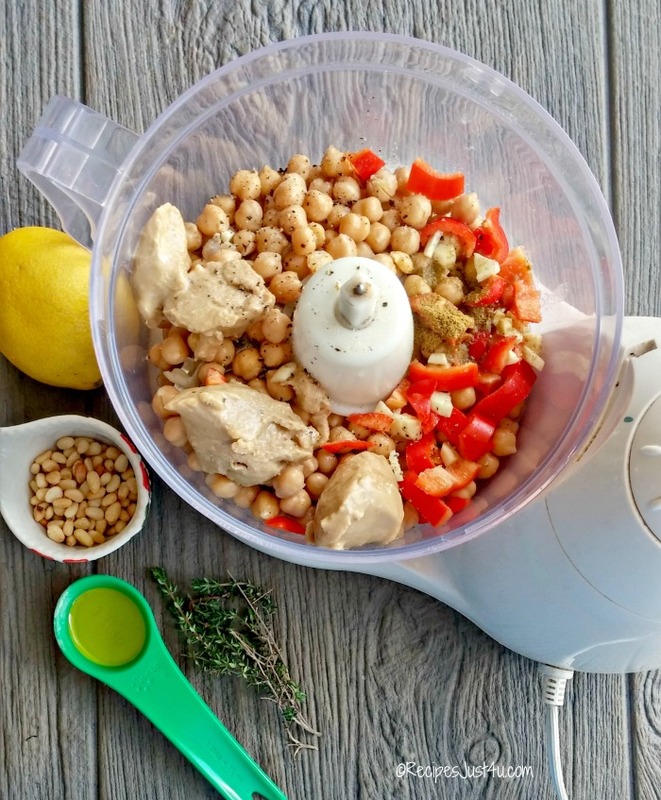 Just gather up all the goodies and get our your food processor and you’ll be good to go! Dump the ingredients into your food processor and pulse until smooth. The Tahinihas a lovely nutty flavor that adds so much delicious taste to this recipe. I saved the pine nuts, the thyme and some of the red pepper to garnish the top. Pulse away! If your consistency is too thick, just add water until it is the thickness that you like. Once it is done, season with Himalayan sea saltand cracked black pepper to taste. TIP: if you want a smoother hummus, you will peel the garbanzo beans. I know, I know…who wants to do that? But trust me. I didn’t do it this time and it tasted perfectly fine, but for a party presentation, where you will want that silky feel to the hummus, peeling those babies are the way to go! 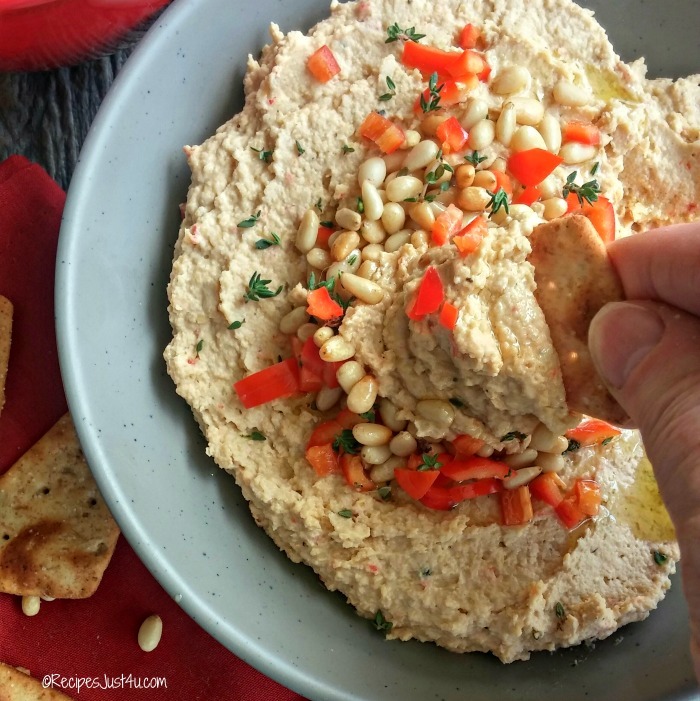 This Red pepper and pine nut hummus is ready in less than a couple of minutes. How cool is that? Just top the finished hummus with some diced red pepper and toasted pine nuts and drizzle with the olive oil. I used Kashi original 7 grain sea salt pita chips to dip today. They have a really nice taste and aren’t too calorie heavy. Cut up veggies work well too. This hummus has the most amazing taste. It is a bit smokey flavored from the cumin and the pine nuts add a nice bit of crunch. 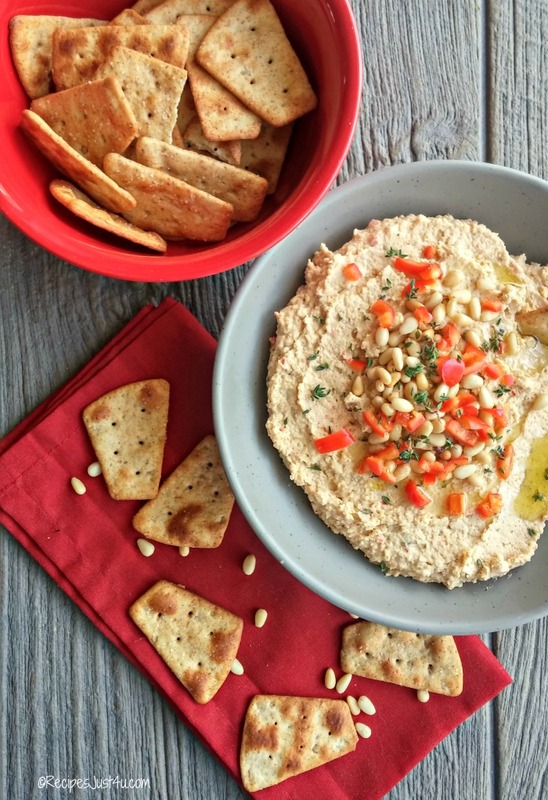 Red peppers give it a sweet touch and it tastes amazing with the Pita chips. Some olives nearby give the whole dish a Mediterranean feel. Just look at this texture. Even without peeling the chick peas it has a smooth and creamy feel to it. I love the versatility of this dish. I often combine it with a protein choice, some veggies, a bit of avocado, and my lovely chickpea Mediterranean black bean salad. 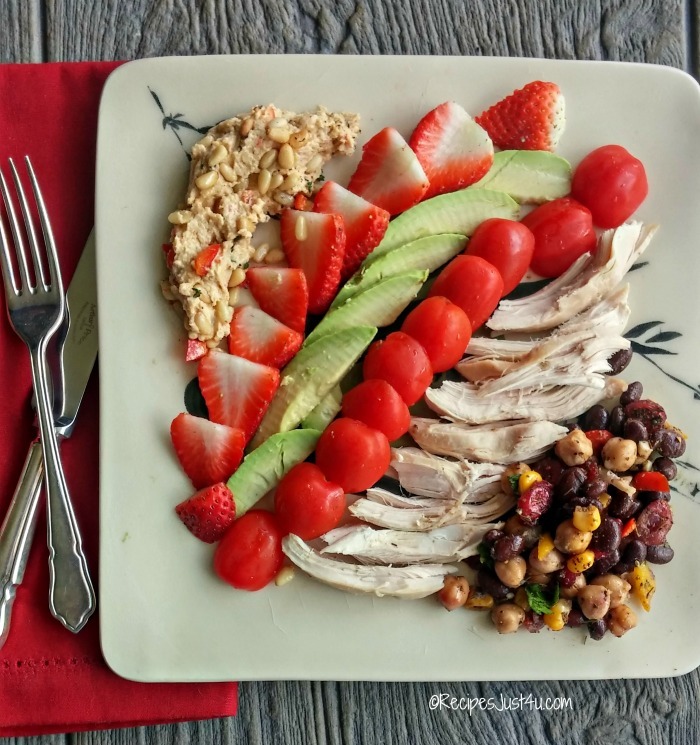 It is a heart healthy lunch that tastes A-MAZ-ING in every delicious mouthful. And I know I won’t feel hungry until dinner time. What about you? Are you fond of hummus? 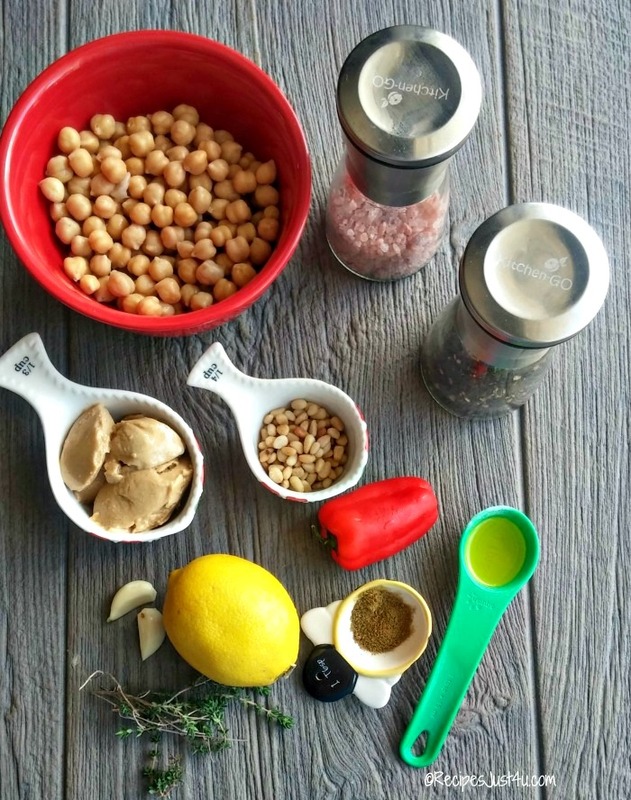 What is your favorite combination to add to the chickpeas before you get our your food processor? Kashi original 7 grain sea salt pita chips. Place the hummus in a small bowl and add the toasted pine nuts and the remainder of the red pepper over the top of it. Drizzle with the olive oil. season with salt and pepper and sprinkle with thyme leaves. Serve with Kashi original 7 grain sea salt pita chips. Also tastes wonderful with slices of mushrooms, cucumber, zucchini and other vegetables.